Anyway, on to happier (and less expensive) subjects. I'm a First Round CYBILS Poetry Judge. Several years ago, CYBILS organizers expanded the poetry category to include novels-in-verse. That year, I think it was 2015, I read HOUSE ARREST by K.A. Holt. I fell in love with Timothy, a middle school kid in a really hard situation. A medically fragile baby brother. A father who can't stand the stress and leaves. A mother who is doing everything she can to take care of her sick child, plus work and provide for her family. The family is in desperate straits, and Timothy, in an effort to help, makes a poor choice and ends up on house arrest. A terrific story. 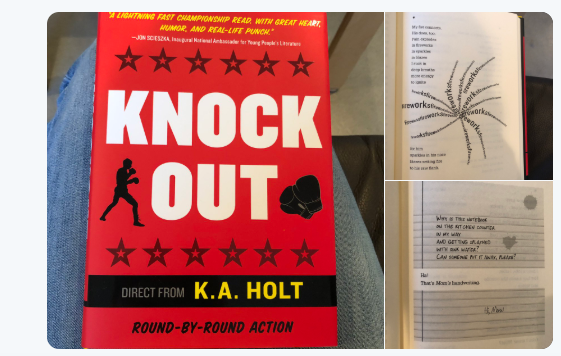 Earlier this week, shortly after I had read KNOCKOUT, I came across a series of tweets on K.A. Holt's Twitter stream. I thought it was a really interesting commentary on novels in verse. It definitely gave me some things to think about as I'm reading for the CYBILS. (Each of them was actually one tweet on K.A. Holt's Twitter feed, but I can't figure out how to format it well). You can't just make words on a page look like poetry. You have to use your poetic elements: imagery, metaphor, simile, assonance, consonance... figure out if your characters might benefit from tanka or haiku or sonnets. The coolest thing about verse novels is that you're distilling the essence of a story to feelings, emotions, impressions, and you're letting your readers take all of that on so they can fill in the rest of the story. There's so much trust when you write poetry. Don't be afraid to trust your readers to get the Big Ideas. They totally will, if you do your job with the poetry. Their experiences and your story will intertwine and create something really beautiful. Verse novels are just so incredible for the way they invite readers into the story. The way the poetry creates a wide, safe net of words is almost indescribable. Everyone can find themselves in a poem, because emotions are universal, right? Now imagine a narrative of poems. Anyway... I could go on and on, but I'll stop. 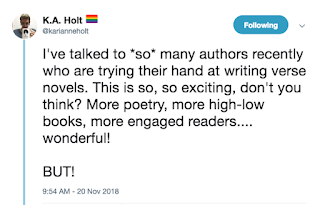 :) I'm just so excited to see so many authors fired up to write verse. We are at the beginning of a poetry explosion, I think. And y'all... I AM HERE FOR IT!! 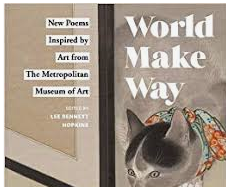 One more thing... did you know that according to an NEA study in 2017, more people are reading poetry now than at any point in the 15 years the NEA has been conducting the survey? People seek out poetry in times of resistance and strife. We need it now, more than ever. When I sit down to write a verse novel, one of the things I like to do, is to incorporate different kinds of poetry into my books. 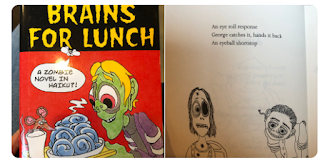 I think this makes it extra interesting to readers, and it gives teachers ideas for poetry activities. With HOUSE ARREST, I went for a journal format, because that gave me parameters as an author. I needed a certain amount of poems per week, and that gave me structure. Students keeping poetry journals have structure, and a new way to express emotions — just like Timothy. I wanted KNOCKOUT to be something completely different, so we tried some shaped poetry. It shows how words can mean different things, and how poetry helps you express yourself in many surprising ways. I also wanted a more visceral notebook for shared thoughts between characters. 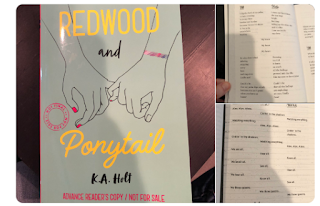 The new book, REDWOOD & PONYTAIL, is my most ambitious, poetically. Because it’s dual POV, I want characters to share poems, share thoughts, experience the same things in different ways. I also incorporated a kind of Greek chorus with poems you can read in any direction. Why? I finished the Roundup, but I'm having formatting issues. I am going to have to work on it later today. My niece and nephew (now 27 and 29) have always called me the "book aunt." They knew that I might give other gifts, but I would definitely give them a book for every birthday and Christmas. And believe you me, these weren't just any books. I would spend months and months searching for the absolutely perfect Christmas present. For my nephew, the book had to include an element of nonfiction. It had to have a unique format. It had to have great illustrations. It had to be a little funny. This year, I would not have any trouble choosing that book for my nephew. 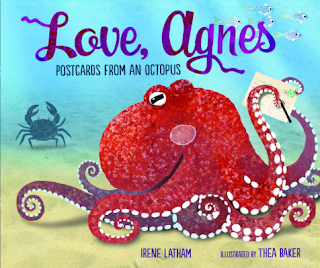 He would definitely be getting Irene Latham's newest, LOVE, AGNES: POSTCARDS FROM AN OCTOPUS. Agnes is a great Pacific Octopus, who lives under a northwestern coastal pier. When the book opens, she's searching for a home. She finds a lovely bottle (which actually ends up being another octopus' home), but there's a postcard blocking the entrance. And so begins a series of postcard exchanges between Agnes and a variety of recipients- little boy named John Henry, another octopus, McKenzie, some crabs, her eggs, and ultimately the world. Dear Andrew,Just because I have a beakthat can crush bones andarms that stretch as wideas a car does NOT makeme a monster. I’m a mollusk,okay? Look it up. 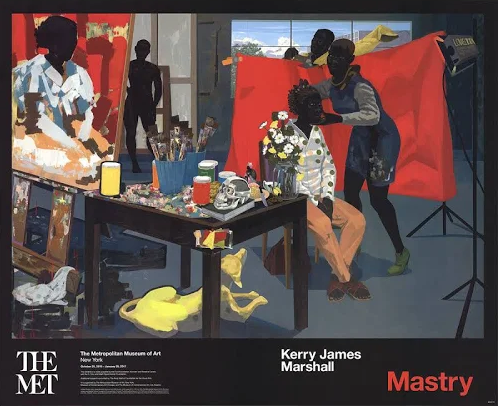 If there's not enough information included in the text, end matter includes "More About Octopuses," as well as a list of further reading and websites. Add this book to your Christmas list! It's sure to be a hit! I'm a long time Julie Paschkis fan. I have read her posts on Poetry Friday for years. 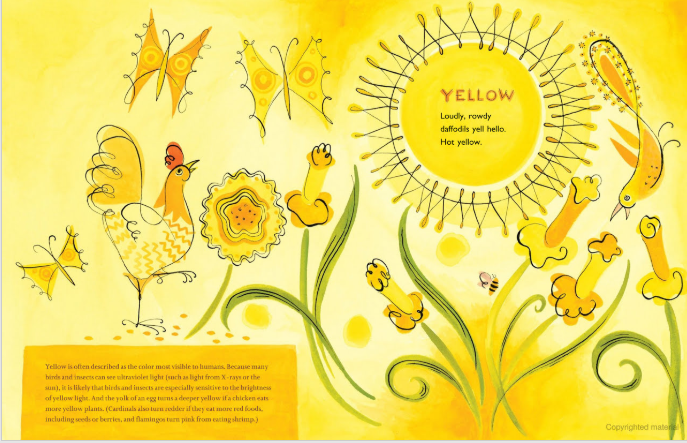 Her last book, FLUTTER AND HUM: ALETEO Y ZUMBIDO, is one of my all-time favorite bilingual books, also one of my favorite animal books. I was excited, then, to see that Julie has a new book included in this year's CYBILS poetry nominees. 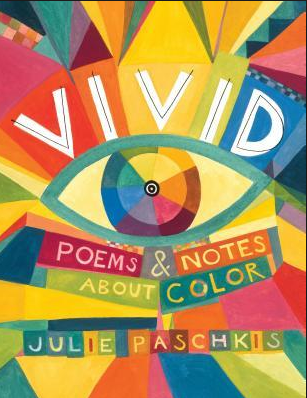 VIVID: POEMS AND NOTES ABOUT COLORS is a wonderful mixture of poems, and science, and fun facts (did you know that in ancient times, in Phoenicia, now Lebanon, purple dye was made from sea snails, and that it took 243,000 snails to make one ounce of dye, which was then sold for three times its weight in gold? 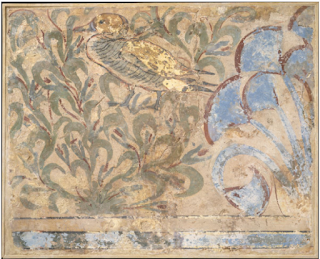 ), and Julie's original folk art. In an author's note in the back, Paschkis says, "In this book, I paint poems of different colors, and I include some colorful facts and questions. I hope it inspires you to explore the art and science of color: to write, read, and draw a blue streak!" 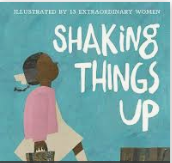 Definitely a book elementary teachers and school libraries will want to own. 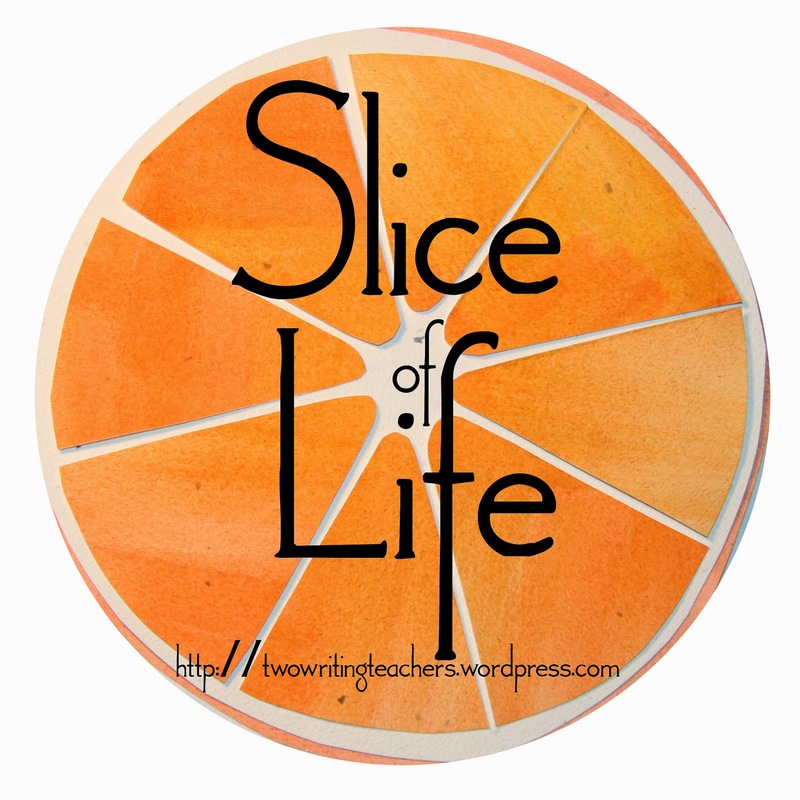 Poetry Friday, and a giveaway, is at fellow Denverite, Linda Baie's, TeacherDance. Nine-year-old Kara goes to the pound to adopt a dog. She doesn't choose one of the five cute golden doodle puppies bouncing around a cage in the corner. Instead, she chooses a scruffy, red brown, one-eyed, tattered ear, maybe part Golden Retriever, cowering in the back of his kennel. She names him Mike Wazowski, after the one-eyed monster in a kids' movie. Now, two years later, Kara's family is forced to evacuate their home because of a forest fire. 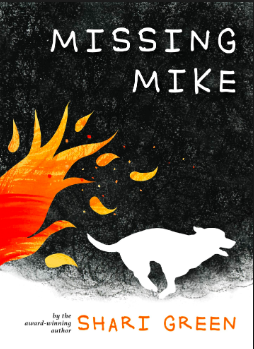 When it comes time to leave, Mike is nowhere to be found and Kara has to leave her beloved, four-legged best friend behind. Kara and her family finds refuge with the Bains, who have opened their home in the emergency. While her parents worry about the status of her home, and her older sister, Sloane, pursues a relationship with a teen dad, Kara searches for solace in crossword puzzles, and a new friendship with Jewel, a foster child in the Bains' home. And all the while, she searches websites and shelters, hoping that her precious Mike has somehow survived. So much to love about this book. A novel in verse about those hard, hard, coming of age years. A main character who is a lover of words. I can't wait to recommend this to readers who love dogs, or words, or Ann Martin's REIGN RAIN.